Cool water prickles around my ankles and calves–sharply contrasting the sticky air I’m swimming in from the knee up. 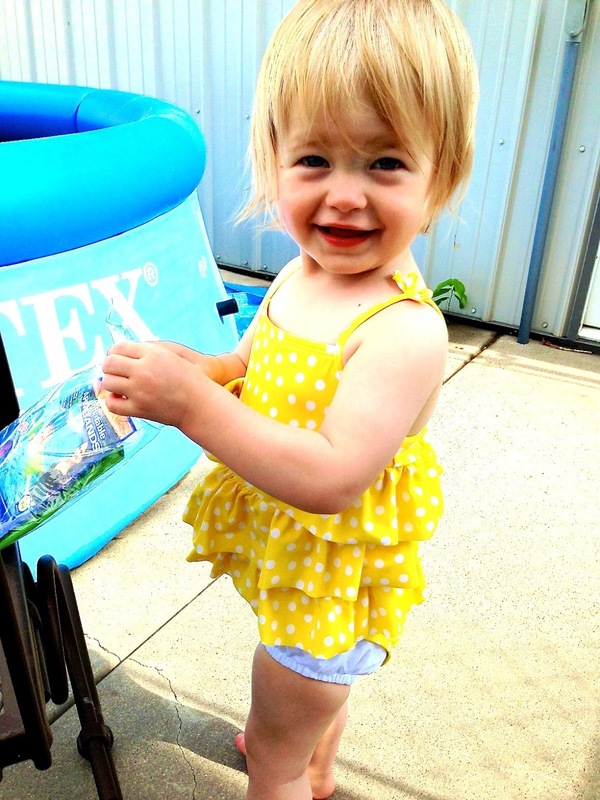 I hold my little yellow-polka-dot-ruffle swimming buddy as she curves her neck to the right, looking down at the water, skimming her fingers across the surface. My legs adjust to the water’s coolness, and I muster gumption to sink down, knowing if I don’t move fast, we’ll stall at knee level. I sink to my waist as the coolness tightens my jaw. Her little legs recoil as tiny arm muscles firm up, curling around my shoulders and neck like a clamp. She monkeys ever higher, climbing up my torso like a jungle gym. After some minutes we settle in slow. Splashes flirt and finally dance with giggles. I’ve felt that tiny leg recoil before. I find myself looking down, terrified at what lurks below. Instead of bravely plunging in, I skirt away, clinging to the familiar and comfortable, terrified to even slip the tip of my toe in. I imagine all manner of things that might be down there. . . meanness, comparison, failure, responsibility, inadequacy, or a to-do list never finished. When fear grips, I need reminding that Someone is holding me tighter, hugging me close, always ready to towel me off, but also daring me to loose my grip and take the plunge to find the splash giggles that have been there waiting for me the whole time. See, I have engraved you in the palms of my hands.